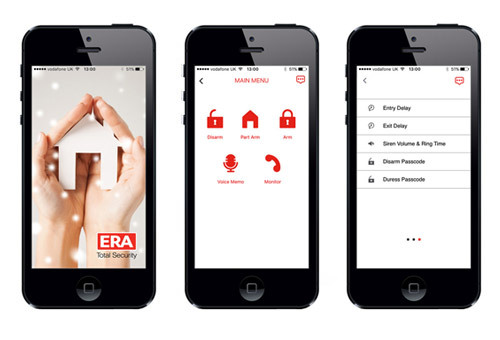 ERA's highest spec alarm system, it's easy to install and use via a smartphone app. Requires connection to a landline or SIM card. Built-in SIM Card holder (standard sized SIM*). The ERA Invincible Alarm PRO is a dual network telecommunicating alarm with integrated mobile phone technology and is operated by a touch screen control panel, which incorporates a SIM Card holder and allows communication directly with the control panel. In addition, the alarm system can be operated via a Smartphone App, one of the included remote controls and can be disarmed by one of the RFID Contactless Tags. When the alarm is triggered, a loud siren will sound from the control panel to alert others of an intruder and the system will also alert you via a phone call or a text message. This alarm kit also includes a wireless solar powered external siren box which produces an 110db siren. The pet friendly sensors activate when larger movement is detected making them ideal for homes with one small pet (less than 20 - 25kg). The detectors should be placed in the corner of rooms that are vulnerable to intruders. When the alarm is armed an infrared sensor will detect any larger movement and activate the loud alarm siren. When the alarm is armed, if a door or window that is protected by the contact is opened the contact is broken activating the loud siren. Fitted to the exterior of the property, the dummy box will add a further visual deterrent to a potential burglar. This ERA alarm is compatible with Safeland (previously Trygve) - an online community that allows people to connect to other people in their local neighbourhood via a SmartPhone app or PC. When connected, the alarm can alert other users when it is triggered and the neighbourhood can then pull together using Safeland messaging to deal with the situation as a team. * Requirements: This alarm system requires a standard sized SIM Card (Excludes Three network). SmartPhone must be iOS 7.0 and above or Android 4.4 and above.